Shorter pleasing circular walks with easy car access are few and far between. avoiding long stretches along the same lane! avoiding lanes with heavy traffic! offering a rich variety of landscapes! selecting only public footpaths which are safe and clearly defined! Ashburton 3.9 One of our most popular walks following part of the Dartmoor Way along the river Ashburn. Chagford 9.5 Superb walks from this bustling Market town exploring the stunning beauty of this part of Dartmoor. Christow 5.4 A delightful walk from this picturesque village to Tottiford Reservoir. Buckfastleigh 6.5 Various popular and scenic walks to explore the beautiful area around Buckfast Abbey. Castle Drogo 4.1 Three delightful walks near Castle Drogo,Drewsteignton ,ideal any time of the year! Grimspound 5.4 During the bronze age Grimspound ,made of granite blocks ,enclosed 24 hut circles,suggesting a milder climate and an abundance of trees. Two popular walks. Haytor 3.4 There is much more to Haytor than a steep climb to the Tor and back again! Two very popular and fairly easy walks in search of a lost village. Hembury Woods 2.9 Two delightful walks through this ancient oak wood and along a most enchanting stretch of the river Dart - a key attraction in Victorian Times! Ivybridge 7 A walker's Gateway to Dartmoor. Lydford 6.8 A delightful walk to Wheal Betsy ,an old copper mine,across stunning moorland using well maintained footpaths and green lanes. Moretonhampstead 4.7 Moretonhamstead ,gateway to Dartmoor,is an ideal town for walkers to explore the lush edge of the moor. North Bovey 5 North Bovey is one of the most idyllic villages in Devon. It is quite isolated and ,perhaps because of this,the village has retained its original charm. An excellent pub walk! 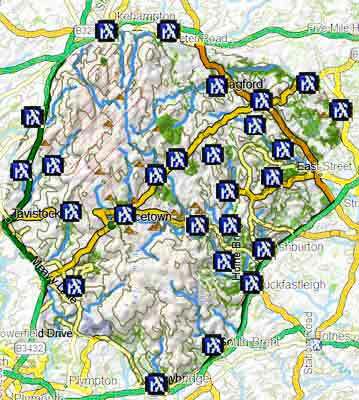 Okehampton 6.7 Popular pub walks to Okehampton Castle & Belstone. Princetown 5.4 Princetown offers the walker spectacular views of Dartmoor's almost volcanic landscapes. Sticklepath to Belstone 4.5 A most scenic pub walk along the river Taw to Belstone following part of the Tarka Trail. Widecombe in the Moor 3.6 Two walks from Uncle Tom Cobley's village with extensive views exploring Tors ,gift and tea shops and perhaps a pub! Wistman's Wood (Two Bridges) 3.9 A unique walk, with extensive views, to a prehistoric oak wood.